Leading Manufacturer of carton labeling machine, round bottle labeling machine, seal labeling machine, security seal labeling machine, test tube label applicator and vrl-120 bottle labeling machine from Ahmedabad. To meet the diversified requirements of our prestigious clients, we are engaged in offering Carton Labeling Machine. The provided coding machine is manufactured as per industry norms using optimum quality components and the latest technology under the guidance of our adept professionals. Used in many industries like pharmaceutical, chemical, dairy, food and cosmetics, this coding machine is available in different sizes and specifications as per the requirements of clients. We are the leading manufacturer and supplier of Seal Labeling Machine. We supply quality Security Seal labeling machine which is demanded all over the world. Security Seal Labeling Machine for Applying Hologram on Products Hologram is a reliable security solution which can protect bags, bottles, containers, boxes, cartons etc. from counterfeiting and refilling. Generally, the hologram labels or sleeves are applied on the bottlenecks which is an additional seal and protection so that the container cannot be replaced once opened. 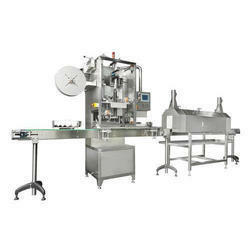 It can be used for packaging Food & Beverages, Medicines, Cosmetics etc. Instead of normal paper labels, hologram labels are highly used nowadays. There are hologram tapes and strips available which can enable the security seal on the containers. This security seal prevents the products from contamination as well as spilling or flowing out of the containers. The hologram seals are used for secure and attractive packaging. When it comes to strict standards of manufacturing, hologram security seal labeling machine can be of great help to you as it can keep products safe and secure. When security seal labeling machines for applying hologram on products were not available, at that time there were higher chances of processed and non processed food to get contaminated. The reason behind that was the wrong type of packaging. Now, when there are security seal labeling machines available, applying hologram strips and tapes has become quite an easy and quick process. The consumers of today have become very smart and they look for only those products which are sealed and packed properly. Thus, the security seal labeling machine for applying hologram on products become very much important for enhancing the sale of products manufactured in your industry. With the valuable assistance of skilled team of professionals, we are engaged in offering an extensive range of high-quality Security Seal Labeling Machine. Suitable for Self ADHESIVE Sticker LABELS / HOLOGRAM to apply on VIALS, AMPULES, BOTTLES, METALIC CONTAINERS, Pre- Filled Sachet / Pouch and BOXES. Material handling Systems like Packing Conveyors, Slat Conveyors and Roller Conveyors & Turn Tables. Counter-Re-winder Machine useful Counting of Labels. Automatic ROPP Aluminum/Screw Capping Machine. Automatic four head / Six Head Volumetric liquidFilling Machine. 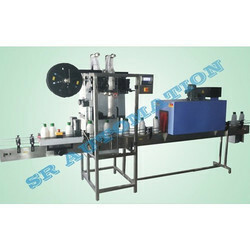 Shrink Tunnel & Shrink Sleeves Applicator Machine. All our literature of product range are enclosed here With for your Study. We request you to enroll our name as approved supplier and send your Valuable enquiry. Thanking you and awaiting your early favorable reply in the matter. 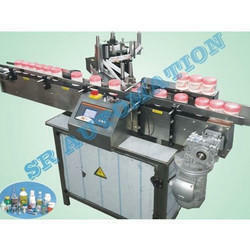 We feel proud to introduce ourselves as the leading manufacturer of VRL-120 Bottle Labeling Machine. With an adjustable guide rail and a hand wheel to adjust the height of the applicator, offered labeller machine is manufactured using optimum quality components and advanced technology under the guidance of adroit professionals. 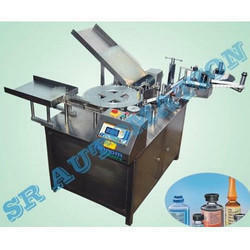 The provided labeller machine can be made as per the needs of our clients in different sizes, shapes and designs. 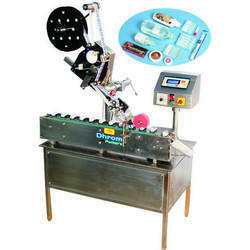 To deliver flawless product to the patrons, this labeller machine is tested on varied parameters. 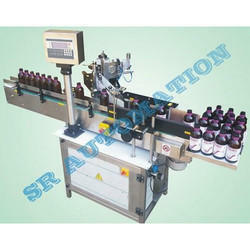 We are manufacturer of 220V Bottle Labeling Machine in Ahmedabad, Gujarat. 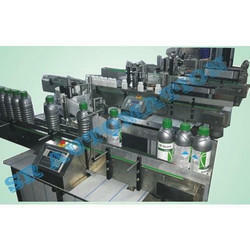 These machines are used in Pharmaceuticals, Beverages Food industries, etc. 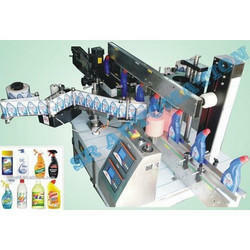 The Ampoule Sticker Labeling Machine the compact flexible design. It is capable of labeling round (including conical) thin diameter ampoules/test tubes pre-fill syringe. Labels can be the partial or full wrap. We are regarded as the leading brand offering Electric Top Sticker Labeling Machine. Provided machines are used for applying sticker/ label/ Hologram Sticker on Top side of any type, shape & size of the container like flexible Bottles, Boxes, Jars, Cassettes, CD, DVD are LID, Corrugated Box, Blisters, Food Packets & Seed Pouches. We manufacture this machine as per the ever-evolving needs of our clients. Our offered machines are the contemporary example of engineering innovation and are widely cherished among our clients. Clients can avail these machines from us at industry leading prices. With our immense domain expertise, we are involved in offering Sticker Labeling Machine. The offered labeling machine is manufactured using quality tested components and advanced technology in compliance with industry norms. Used in labeling on single side, both sides simultaneously on any shape and sizes, we offer this labeling machine in different designs and sizes as per the needs of the customers. 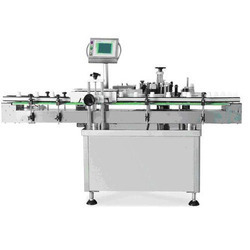 In order to provide a qualitative range, this labeling machine is tested on different quality measures. This model is used for precise labeling on both sides simultaneously on any type like Aluminum, Plastic, Glass, HDPE bottle. pharmaceuticals / Beverages / Diary and Food industries. We are offering Shrink Sleeve Label Applicator to our client. This machine used in water/food/oil industries. 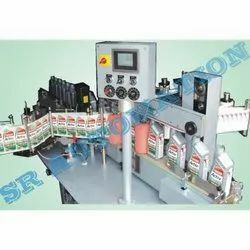 Owing to the dedication of our diligent professionals, we have earned a reputed name in manufacturing the finest quality assortment of SS Shrink Sleeve Applicator Machine. Under the guidance of our adept professionals, this label applicator is manufactured using quality tested components and sophisticated technology. Used for food & beverage, cosmetic & herbal, dairy and pharma & agriculture, the offered label applicator is highly praised by the clients owing to its different quality examiners. On-line speed can be varying. Advance high-speed PLC control unit. Stainless steel construction including the main machine frame. Speed Up to 300 BPM. On-line speed can be varied. Fully touch color display (HMI). 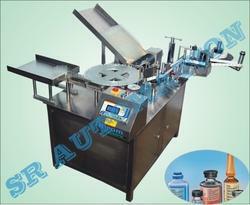 Automatic Rotary Labelling Machine are most suitable and widely used in pharmaceutical for labeling application. Ampoule / Vial Labelling Machines are designed for Full / Partial labeling on small & Thin Diameter, difficult to handle, round products such as Vials, Ampoules, and Test Tubes. 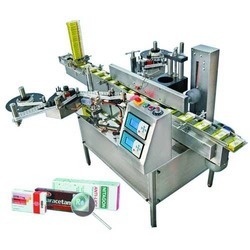 Ampoule / Vial labeling machines are suitable for independent operation and can also be connected with line operation. 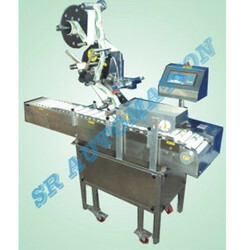 SR Automation's Rotary Labeling Machine consists of a Feeding Worm set. On pressing Run the Worm and Product Wheel, the products once Enter through feed worm product travel until they come in contact with the star wheel which places the product into the rotating wrap belt for labeling. Once products are labeled the feed off the machine through the out star wheel and into the integrated conveyor or Collect in outlet tray collection. Fragile Products / Glass Vials / Eye drop etc. Soft-sided bottles - maintaining good control. 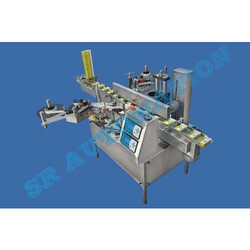 With our immense domain expertise, we are involved in offering Semi Automatic Double Side Labeling Machine. The offered labeling machine is manufactured using quality tested components and advanced technology in compliance with industry norms. Used in labeling on single side, both sides simultaneously on any shape and sizes, we offer this labeling machine in different designs and sizes as per the needs of the customers. In order to provide a qualitative range, this labeling machine is tested on different quality measures. 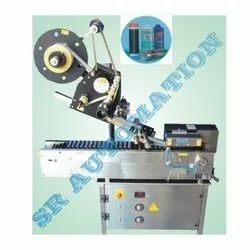 We are manufacturer of Double Side Sticker Labeler in Ahmedabad Gujarat. 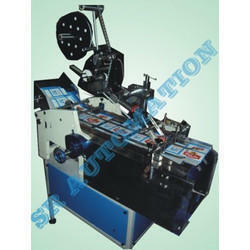 We offer ( Double Side) Automatic Sticker Labeling Machine. Fully Automatic, User-Friendly, Sticker (Self-Adhesive) Labeling Machine Model, Suitable to apply accurate Labels on Double Side (Front And Back) of Flat/Oval/Square shaped products having PET, Plastic, HDPE, LDPE, Glass or any other surface. The Fully Automatic Double Side (Front And Back) Sticker Labelling Machine are 100% user Friendly, Virtually Maintenance Free and does not require Data Inputs for Label Size. These are offered at industry leading rates and are used in. Beverages, Diary and Food industries.